ATLANTA — Richard Freeman spent 21 years on the board of the SPE Thermoforming Division, where he often challenged fellow formers, along with machinery and sheet suppliers, to improve the industry’s quality and image. “See, if you don’t ask the hard questions, you don’t get the answers. You don’t get the answers, you can’t move forward,” he said. Now Freeman has become the 2013 Thermoformer of the Year. 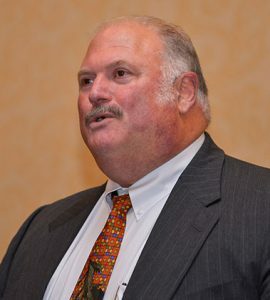 He gave a speech at an awards dinner Sept. 10 during the Society of Plastics Engineers Thermoforming Conference in Atlanta. During the upbeat speech, he marveled at the industry’s progress. But some of his other presentations have become legendary as a call to arms to improve thermoforming — especially on the heavy-gauge side. Running his company, Freetech Plastics Inc. in Fremont, Calif., in the heart of Silicon Valley, gave Freeman a different perspective. Freetech served the booming computer sector, markets that required more-dramatic, complex shapes and parts that need painted. Freeman later coined the term “West Coast style” of thermoforming to explain the process to the design community. He helped the industry forge strong connections to designers through the Industrial Designers Society of America. “There’s been an SPE Thermoforming Division presence at every IDSA conference since 1998,” he said. He is a frequent speaker and writer. And Freeman does speak with a deep, mellow voice, kind of like a jazz radio DJ. So Freeman did give that paper at SPE’s Antec conference, calling for a new era of quality in thermoforming. “And when I was done the room was evenly split between, ‘that was great’ and, ‘who’s got a rope? '” he said, as his fellow thermoformers laughed. Freeman went to the first official Thermoforming Conference in 1991, in the Wisconsin Dells. He’s been going to them ever since, for 21 years. At the 1991 conference, he got the second-to-last room at the hotel. He credited a pioneer of West Coast thermoforming, Dave Sleeper, an early former who crafted wooden tools for his company, Premier Plastics. Freetech was located nearby. The company had two forming machines, machining equipment and an early computer-aided-design system. The company could fabricate surface contours and curves. “And we thought we could take that CNC equipment, and machine good aluminum tools, with really interesting venting. That we could do something that might be different. Might be unique,” Freeman recalled. “And with a growing Silicon Valley around us, we had lots of startups in need of limited-run parts. The market went crazy. And soon, our machining and fabrication business became a thermoforming business. “And we began work on shapes that were considered unformable. But it’s really because we didn’t know we couldn’t do it,” Freeman said. When CNC routers came out in the late 1980s and early 1990s, they were designed for woodworking, not plastics forming. Freeman led the call for more accurate equipment. And heater technology has advanced greatly, as has CAD, he said. “Think about the size, quality and reach of our industry 25 years ago, and what it’s like today, and a lot of that is because of this board and the things that we’ve done,” he said. But Freeman said the industry still needs to promote itself. And he got some laughs in the process. What is West Coast thermoforming? Rich Freeman gives a presentation on the subject at IDSA conferences, with plenty of product photos. Silicon Valley’s computer companies are looking to set themselves apart with product styling. In West Coast thermoforming, 75 percent of the parts are painted, while in the Midwest, most parts have texture molded in. “It gives you freedom to do creative shapes and draws because you’re not worrying about the texture molded in,” he said. The same goes for medical. They also need low-volume parts with a high level of styling.